We are in a day and age of being bombarded from every direction to get the newest, the best, the most current, the most advanced, the most technological. With everything being mass-produced and people looking for whatever they can get quick and cheap, we often lose authenticity, wouldn’t you agree? The Hudson Valley is a special area in the fact that people here are committed to sustainability, to supporting local, to honoring and encouraging local entrepreneurs and businesses. We have farm markets all over where you can actually meet the farmer whose hands planted what you are going to eat for dinner. Sugar Loaf, NY is an extraordinary place that we are highlighting today in our list of favorite local towns. Not too far away from us—about 20 minutes actually—is a quaint town called Sugar Loaf. It made our list of top five favorite nearby towns because of what is has to offer and simply because there just isn’t another place like it. Founded in 1756, Sugar Loaf still has many of the barns and buildings and artists actually still live in and work out of these historical places. 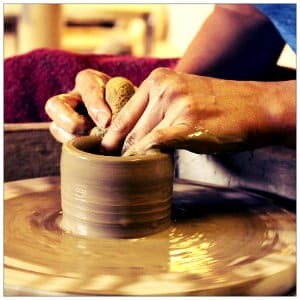 It is an arts community where you can find dozens of handmade art, crafts and gifts ranging from ceramics, to Native American items, to leather, furniture, paintings, candles, jewelry, pottery, and homemade jams and honey to name just a few. On craft fair days the streets hold all kinds of vendors selling their creations It is a great place to spend a day strolling, browsing, and meeting all sorts of interesting people! You’ll find some breathtaking nature photography at the Exposures Gallery—if you are lucky the photographer himself will be there and you can hear his stories on where his incredible images came from. The shops are open year round Thursday through Sunday. Some shops may be open more often so we encourage you to check the individual shop pages for details. You’ll also enjoy a state of the art theater, many delicious restaurants. Take a break from the impersonal, big box stores and step into a place where creativity and incredible craftsmanship are truly honored—you won’t be disappointed!